From layman end-users to large enterprise employees, content access has become a necessity for each of us. It is not just about the type of content that is accessed but the array of devices used to access the content and the network bandwidth utilized/necessary to deliver that content. This process isn’t made any easier in this era of video technology, where videos are increasingly becoming the main source of learning, training, marketing, communication and much more. This is where transcoding comes in. Simply put, video transcoding makes sure that the video uploaded is converted into multiple digital formats (to ensure video playback on multiple devices that support different formats/browsers) and these multiple digital formats are also converted into multiple sizes (to ensure adaptive bitrate streaming in cases of network congestion in particular locations). Hence, the process of transcoding improves video delivery and playback for vast ranges of users using multiple devices (computers, laptops, smart phones, tablets etc.) and browsers (Microsoft Edge, Google Chrome, Mozilla Firefox, Opera etc.). There has been a general confusion when it comes to the terms video encoding and transcoding, where these terms are used interchangeably but are not the same in their actual definition. Video encoding refers to converting analog source of video into digital content, a process that takes place when your camera captures the analog stream and converts it into digital data or when you convert your old VCR video tapes into DVDs having mp4/avi formats. On the other hand, video transcoding refers to converting a digital format of video into another digital format, a process that takes place for adaptive bitrate streaming, or ensuring playback on different devices and browsers. While transcoding, a video is converted into multiple renditions. An encoding profile explains certain parameters such as digital file format, size, audio/video bitrates and codecs, framerates etc. A video would be transcoded to multiple renditions depending on the encoding profiles that are configured and enabled. Encoding profiles are not just configured for videos but for audios, multi-bitrate streaming (HLS, Smooth Streaming etc.) and transcripts as well. For instance, when a video is transcoded, it will also be captioned depending on whether the transcript generation encoding profile is enabled or not. 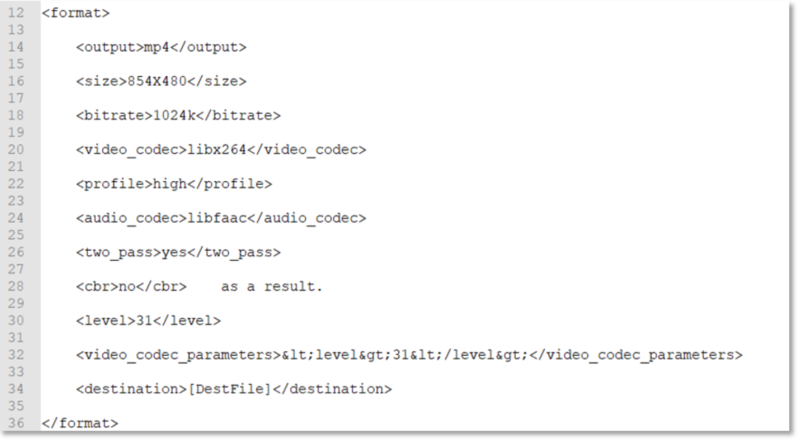 Following is an example of an encoding profile that converts a video in MPEG4 format of size 480p, bitrate 1024k etc. This encoding profile is sent to the encoding provider along with the video and as a result, the encoding provider returns the encoded video file. VIDIZMO, an Enterprise Video Content Management solution, not only provides different options when it comes to encoding but also provides the ease of adding and configuring multiple encoding profiles through its video portal. VIDIZMO also facilitates its customers by integrating with various encoding providers simultaneously. For more details, read about VIDIZMO Transcoding. VIDIZMO provides its customers the most flexible integration options across any enterprise infrastructure. For encoding too, VIDIZMO offers flexible integration options with any hardware or software encoding provider. Broadly these options can be classified as on-premise encoders and cloud encoding providers. As mentioned, VIDIZMO has the capability to integrate with any on-premise encoder of your choice. VIDIZMO natively utilizes FFmpeg -- one of the biggest open-source, cross-platform frameworks for format transcoding, basic video editing and scaling. FFmpeg not only provides a wide range of libraries and programs for video and audio manipulation but also gives an easy-to-use command-line programming interface, making it one of the most widely used transcoding open-source software. VIDIZMO also uses other encoders such as Telestream Wirecast, Open Broadcast Software (OBS) or any encoder of a customer’s choice. VIDIZMO is provider-agnostic for cloud encoding and streaming services. Cloud encoding offers the scalability to increase encoding efficiency while also providing support for multiple file formats. With rapid cloud innovation and advancements, cloud encoders provide superior encoding features such as dynamic packaging, auto-transcription in multiple languages, image and audio overlays etc. VIDIZMO integrates with Microsoft Azure Media Services (AMS) allowing customers to just pay for the encoding features utilized, rather than subscribe to a whole lot of services that go unused. VIDIZMO cloud transcoder also allows its users to track the workflows from within the video portal, keeping track of when encoding took place while uploading and when it was completed. Click here to read more about behind-the-scenes of video uploading. VIDIZMO offers one of the most robust and flexible encoding options that allow our customers to use the encoding tools of their choice, in any types of organization IT infrastructure. To know more about VIDIZMO encoding capabilities or how we can provide interoperability with your existing IT or business ecosystem, contact us or refer to our website to explore various integration options.